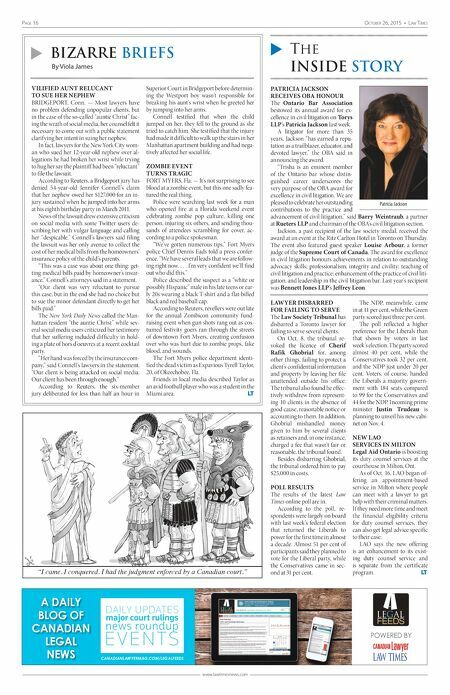 Page 16 OctOber 26, 2015 • Law times www.lawtimesnews.com PATRICIA JACKSON RECEIVES OBA HONOUR The Ontario Bar Association bestowed its annual award for ex- cellence in civil litigation on Torys LLP's Patricia Jackson last week. A litigator for more than 35 years, Jackson "has earned a repu- tation as a trailblazer, educator, and devoted lawyer," the OBA said in announcing the award. "Trisha is an eminent member of the Ontario bar whose distin- guished career underscores the very purpose of the OBA award for excellence in civil litigation. We are pleased to celebrate her outstanding contributions to the practice and advancement of civil litigation," said Barry Weintraub, a partner at Rueters LLP and chairman of the OBA's civil litigation section. Jackson, a past recipient of the law society medal, received the award at an event at the Ritz Carlton Hotel in Toronto on Thursday. The event also featured guest speaker Louise Arbour, a former judge of the Supreme Court of Canada. The award for excellence in civil litigation honours achievements in relation to outstanding advocacy skills; professionalism; integrity and civility; teaching of civil litigation and practice; enhancement of the practice of civil liti- gation; and leadership in the civil litigation bar. Last year's recipient was Bennett Jones LLP's Jeffrey Leon. VILIFIED AUNT RELUCANT TO SUE HER NEPHEW BRIDGEPORT, Conn. — Most lawyers have no problem defending unpopular clients, but in the case of the so-called "auntie Christ" fac- ing the wrath of social media, her counsel felt it necessary to come out with a public statement clarifying her intent in suing her nephew. In fact, lawyers for the New York City wom- an who sued her 12-year-old nephew over al- legations he had broken her wrist while trying to hug her say the plaintiff had been "reluctant" to file the lawsuit. According to Reuters, a Bridgeport jury has denied 54-year-old Jennifer Connell's claim that her nephew owed her $127,000 for an in- jury sustained when he jumped into her arms at his eighth birthday party in March 2011. News of the lawsuit drew extensive criticism on social media with some Twitter users de- scribing her with vulgar language and calling her "despicable." Connell's lawyers said filing the lawsuit was her only avenue to collect the cost of her medical bills from the homeowners' insurance policy of the child's parents. "This was a case was about one thing: get- ting medical bills paid by homeowner's insur- ance," Connell's attorneys said in a statement. "Our client was very reluctant to pursue this case, but in the end she had no choice but to sue the minor defendant directly to get her bills paid." The New York Daily News called the Man- hattan resident "the auntie Christ" while sev- eral social media users criticized her testimony that her suffering included difficulty in hold- ing a plate of hors d'oeuvres at a recent cocktail party. "Her hand was forced by the insurance com- pany," said Connell's lawyers in the statement. "Our client is being attacked on social media. Our client has been through enough." According to Reuters, the six-member jury deliberated for less than half an hour in Superior Court in Bridgeport before determin- ing the Westport boy wasn't responsible for breaking his aunt's wrist when he greeted her by jumping into her arms. Connell testified that when the child jumped on her, they fell to the ground as she tried to catch him. She testified that the injury had made it difficult to walk up the stairs in her Manhattan apartment building and had nega- tively affected her social life. ZOMBIE EVENT TURNS TRAGIC FORT MYERS, Fla. — It's not surprising to see blood at a zombie event, but this one sadly fea- tured the real thing. Police were searching last week for a man who opened fire at a Florida weekend event celebrating zombie pop culture, killing one person, injuring six others, and sending thou- sands of attendees scrambling for cover, ac- cording to a police spokesman. "We've gotten numerous tips," Fort Myers police Chief Dennis Eads told a press confer- ence. "We have several leads that we are follow- ing right now. . . . I'm very confident we'll find out who did this." Police described the suspect as a "white or possibly Hispanic" male in his late teens or ear- ly 20s wearing a black T-shirt and a f lat-billed black and red baseball cap. According to Reuters, revellers were out late for the annual Zombicon community fund- raising event when gun shots rang out as cos- tumed festivity goers ran through the streets of downtown Fort Myers, creating confusion over who was hurt due to zombie props, fake blood, and wounds. The Fort Myers police department identi- fied the dead victim as Expavious Tyrell Taylor, 20, of Okeechobee, Fla. Friends in local media described Taylor as an avid football player who was a student in the Miami area. LT A DAILY BLOG OF CANADIAN LEGAL NEWS FEEDS LEGAL POWERED BY CANADIANLAWYERMAG.COM/LEGALFEEDS FEEDS LEGAL POWERED BY LegalFeeds_LT_Dec1_14.indd 1 2014-11-26 9:44 AM u Bizarre Briefs By Viola James u The InsIde story LAWYER DISBARRED FOR FAILING TO SERVE The Law Society Tribunal has disbarred a Toronto lawyer for failing to serve several clients. On Oct. 8, the tribunal re- voked the licence of Cherif Rafik Ghobrial for, among other things, failing to protect a client's confidential information and property by leaving her file unattended outside his office. The tribunal also found he effec- tively withdrew from represent- ing 10 clients in the absence of good cause, reasonable notice or accounting to them. In addition, Ghobrial mishandled money given to him by several clients as retainers and, in one instance, charged a fee that wasn't fair or reasonable, the tribunal found. Besides disbarring Ghobrial, the tribunal ordered him to pay $25,000 in costs. POLL RESULTS The results of the latest Law Times online poll are in. According to the poll, re- spondents were largely on board with last week's federal election that returned the Liberals to power for the first time in almost a decade. Almost 51 per cent of participants said they planned to vote for the Liberal party, while the Conservatives came in sec- ond at 31 per cent. The NDP, meanwhile, came in at 11 per cent, while the Green party scored just three per cent. The poll ref lected a higher preference for the Liberals than that shown by voters in last week's election. The party scored almost 40 per cent, while the Conservatives took 32 per cent, and the NDP just under 20 per cent. Voters, of course, handed the Liberals a majority govern- ment with 184 seats compared to 99 for the Conservatives and 44 for the NDP. Incoming prime minister Justin Trudeau is planning to unveil his new cabi- net on Nov. 4. NEW LAO SERVICES IN MILTON Legal Aid Ontario is boosting its duty counsel services at the courthouse in Milton, Ont. As of Oct. 16, LAO began of- fering an appointment-based service in Milton where people can meet with a lawyer to get help with their criminal matters. If they need more time and meet the financial eligibility criteria for duty counsel services, they can also get legal advice specific to their case. LAO says the new offering is an enhancement to its exist- ing duty counsel service and is separate from the certificate program. LT Patricia Jackson "I came. I conquered. I had the judgment enforced by a Canadian court."